I was originally going to use this post to continue the debate over the now infamous Rolling Stone cover photo (as an aside, I encourage everyone to read the article, which was very well written) of Boston Marathon bomber Dzhokhar Tsarnaev. I was going to talk about how people who think Rolling Stone made an unethical decision are wrong, about how Tsarnaev looks nothing like Jim Morrison. I don’t think that is going to resolve anything, though. The day Rolling Stone released the cover and story, I was arguing with people on Facebook about the article’s content, the decision to put Tzarnaev on the cover, and the quality of the photography. I got up for a break, and walked past people arguing about something else on TV in the next room. Public discourse seems to have become a never-ending cycle of outrage. People get outraged at things like this, then other people get outraged at the first group’s outrage. Meanwhile, nothing gets resolved. People have every right to be upset when they see Tsarnaev’s photo in such a prominent place. They have gotten upset, and it hasn’t stopped there. What’s amazing is how quickly a visceral reaction to something like this gets cloaked in logic. It’s as if people know that they are overreacting to something and feel they have to cover up that blatantly emotional response with reasons. So the debate shifts from pure anger over having to look at Tsarnaev’s face every time one walks into Barnes & Noble to concerns over how the image is disrespectful to the people of Boston, or how its “glamorization of terrorism” could inspire copycats. Consequently, the opposition fires back with reasons of its own: freedom of the press, the importance of knowing something, anything, about this unprecedented act of terror, and the acknowledged difficulty in predicting how potential copycats will respond to specific media images. 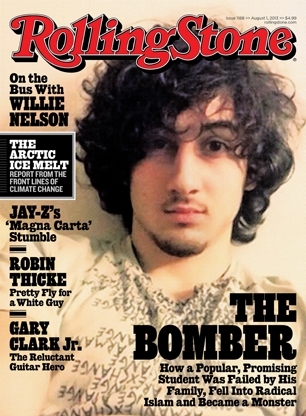 It won’t work, though, because the people boycotting Rolling Stone aren’t interested in a rational debate; they’re still just upset over seeing Tsarnaev on the cover. They won’t respond to rational arguments because they aren’t being sincerely rational. In America, logic and emotion are confused way too easily. We use terms like “belief” and “morality” to bridge the gap between these two polar opposites. We have an initial reaction to something and cling to it tenaciously until Judgment Day. Instead of being resolved, the issues of the day gradually fade away as people get sick of talking about them. Soon, Willie Nelson will be on the cover of Rolling Stone again, Tsarnaev will be on trial, and we’ll all have something new to be outraged over. This entry was posted on July 19, 2013, 2:42 pm and is filed under Media, Politics. You can follow any responses to this entry through RSS 2.0. You can leave a response, or trackback from your own site.